ArcticInsider - The Phantom Comes Alive! Phantom and crew were at Nielsen Enterprises in the video and some of the pix below. 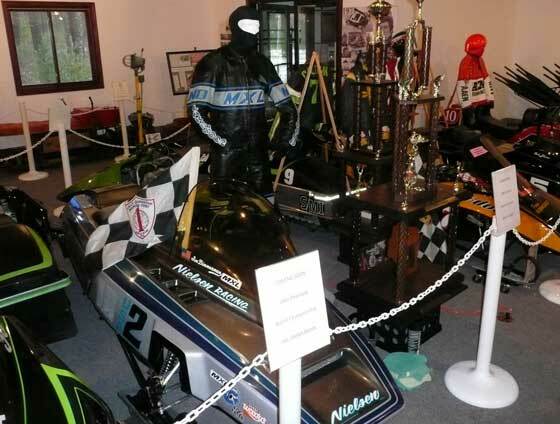 Since then the Phantom has made its way to the Snowmobile Hall of Fame in St. Germain, where it will remain until making the short jaunt to Eagle River for the 50th. Dimmerman WILL run Phantom around the famed ice oval. What remains to be seen is just how much wood he'll put into the fire. 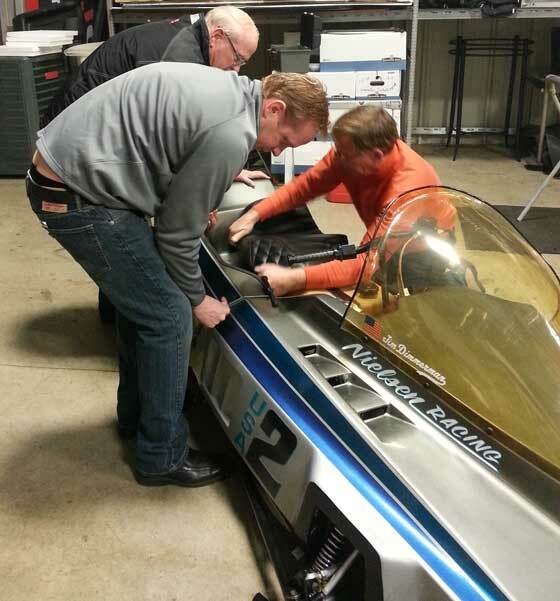 Ted Nielsen, Jeff Nielsen and Dimmerman put the final touches on the famed Phantom. 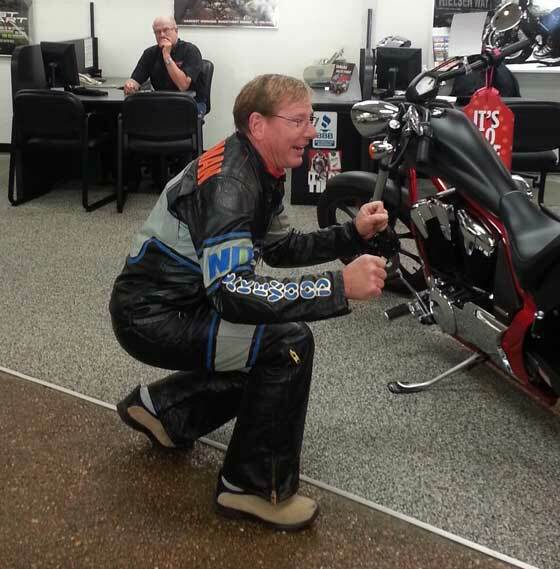 Showing just how spry he is, Dimmerman dons his race leathers from 1984 and performs his best Karate Kid impression. I wonder what Ted Nielsen is thinking in the background? Here's Phantom in the SHOF display. 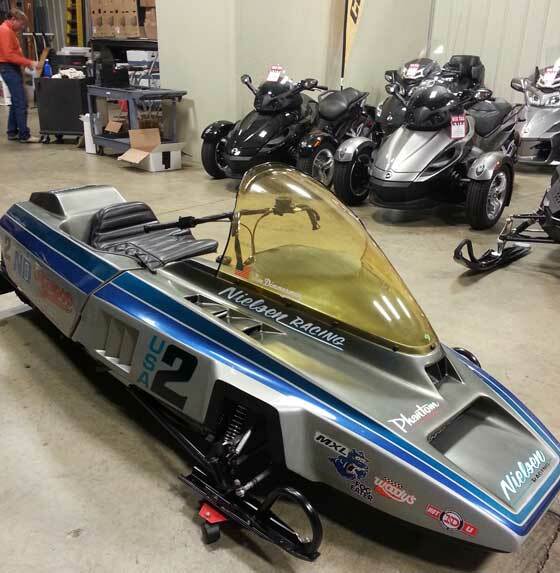 This and many other Eagle River World Champion race sleds will be on display from now until the 50th celebration. Definitely worth checking out! To Ted and Jim and the entire Nielsen cew, a BIG THANK YOU for all the work you have done to make this a reality. The restoration to the winning 1984 Phantom turned out beautiful........a great tribute to a great champion and a great team........and it sounds good too. The Hall of Fame in St. Germain, started our project to have a special 50th Eagle River Derby Exposition over 5 years ago. Now with so many world championship sleds, trophies, leathers and photos all coming together....IT IS AWSOME. Nice work on the preservation of this historic sled Jim! The work you have done will allow the stories from a great era in oval racing to be retold/shared for generations to come. Loren: Your 50th anniversary display is looking great in the photo, I'll be eager to see everything during your upcoming Ride With the Champs event in February. Sled sounds amazing, but was this filmed with a potato? Loren...this is a Drop in the Bucket compared to what YOU have done. I promised you, I'd get it done for the 30th, but I will tell you it's been a heart felt reunion with Ted , Donna , Jeff , and Christie Nielsen. Their were tears in our eyes when I first started it Wed night, after nearly 30 years , of sitting quiet. Ted's entire business and nearly 100 employees all put forth some kind of effort to see this project thru.. They connected with it and felt to be a part of the Team. ..That is Priceless. Hopefully Jim throws a lot of wood in the phantom's fire. hahaha.. It would be interesting to see what kind of lap it will run vs the new iron. hopefully someone has a stop watch running when it does some laps. Good to see you can still climb into your old skins Jim! Awesome! I don't know if I'm more excited to see the sled in person or hear all the stories that come out as a result of the sled being brought back to life. Great work guys! We were all standing in Ted's showroom and Christie say's where is your suit ? So I went to my car to retrieve it knowing full well that the next question will be "does it still fit"? Flashes of embarrassment were going thru my mind with all my friends standing there. My weight back in the day was about 180lbs now it's about 190.. Fortunately my jacket was measured with a Kevlar vest on and that gave me just alittle extra without it, enough to silence the gallery watching...So I will be wearing it for my Eagle laps. Also another piece of trivia I just learned about....It seems some of the boy's have replaced the engines from the originals to a much "larger" displacement...46 mm carbs have been found, I wouldn't be surprised if someone's packin some spray...I guess we'll have to have some "Teching" before we enter the track...I may have come to a gunfight with a knife..
Hey Dimmerman, for the record it's a IPhone 5 and your jealous. Great to see the Phantom restored to its championship glory. How about a five lap HOF race with a few championship sleds??? Maybe you can convince Brad and Preston's RXL to make an appearance! Regarding my musings above wondering if anyone besides an Arctic had won a World Championship...a very kind and knowledgeable man has shared the statistics with me: Ski-Doo is in 1st place with 24 wins at Eagle River, Arctic Cat has 10. Then Polaris 7, Yamaha 3, Wahl Bros 2; and one each of Evinrude, Allouette, Phantom, Scorpion.